The federal budget is arguably the most comprehensive representation of the federal government’s priorities. Policymakers use the budget to determine not only how much to spend and where to get the money, but also how to best allocate limited taxpayer dollars. Yet if the budget truly reflects our national priorities, one would be left with the unfortunate conclusion that children and the well-being of younger generations represent a declining priority. Historically, most of the federal budget was allocated annually by Congress through the appropriations process, encouraging policymakers to review spending programs and priorities on a regular basis. Today, however, much of the budget is on autopilot through mandatory spending, with these programs heavily skewed toward the elderly. In addition, budgetary decisions over the past decade have disadvantaged programs for younger Americans, while high and rising levels of federal debt will leave a massive future burden on today’s children to service and reduce that debt.  In a new series, Budgeting for the Next Generation,[*]we will review federal programs for children and assess how they fare in the budget and under the budget process. Children’s share of the federal budget is projected to continue to shrink over time as rising adult entitlements and debt service payments crowd out this spending. Below, we summarize these issues. Future papers in the series will explore each issue in greater depth and identify policy and process solutions that would help improve the budget’s focus on children. Children represent some of the most vulnerable members of the population, facing higher poverty rates than adults and possessing little to no ability to provide for their own well-being. At the same time, private and public spending on children can be among the best investments in long-term economic growth, potentially resulting in a healthier, smarter, more skilled, and more innovative future workforce. Given these realities, there is a strong case for a government role – including a federal role – in supporting younger Americans. Children currently make up a disproportionately large share of the population living in poverty. According to the Census Bureau, 18.0 percent of children under age 18 lived in households with incomes below the federal poverty guideline in 2016. By contrast, the poverty rate for the population ages 18-64 stood at 11.6 percent, and the poverty rate for those 65 and older was 9.3 percent. Different poverty measures also show children face higher poverty rates than older groups. Federal programs for children therefore play an important role in ensuring their basic needs are met. Programs for children are designed to ensure they are housed, fed, educated, and provided with basic services to survive and become productive adults. These programs not only improve child well-being, but also help to support long-term economic growth. Over the long term, Gross Domestic Product (GDP) is largely determined by the productivity and size of the labor force, which itself is determined by workers’ health, knowledge, skills, and work ethic (as well as the technology they have access to). A wealth of scientific literature finds that many of these positive traits are more easily acquired earlier in life and that early interventions promote cumulative improvements as children age. Some spending on children can therefore be considered a public investment in human capital, resulting in more productive and successful adults and a larger economy. Of course, this includes spending on education, but other federal programs for children can also improve economic outcomes in adulthood. One study, for example, found that children covered by Medicaid and Children’s Health Insurance Program (CHIP) expansions go on to attend college in higher numbers, pay more in taxes, and collect less in government benefits as adults. Another found that access to Supplemental Nutrition Assistance Program (SNAP) benefits in early childhood led to better health in adulthood and increases in economic self-sufficiency for women. There is clearly a strong case for federal spending on children. Cost-effective federal support for children can help promote their health and development and reduce the financial strain faced by their families. Certain programs can also generate a substantial return on investment in the form of a more productive future workforce. Despite the public benefits of federal government support for children, spending on programs for children makes up a small share of the federal budget. The Urban Institute’s annual Kids’ Share report takes a comprehensive look at the share of public resources going towards children. According to the latest report, total federal outlays for children in Fiscal Year (FY) 2016 totaled about $377 billion, or about 9.8 percent of the federal budget. Federal support for children is delivered through several different programs. According to the 2017 Kids’ Share report, many of the largest sources of federal support for children are programs that are not limited to families with children – Medicaid, the Earned Income Tax Credit (EITC), SNAP, and Social Security. Combined, these four programs account for 52 percent of federal outlays on children, even though spending on children amounts to just 14 percent of their cost. Other programs that provide benefits or services to both children and adults, such as Supplemental Security Income (SSI) and public housing, make up another 15 percent of federal spending on children. The remaining one-third comes from a multitude of smaller programs that are largely exclusive to those under 18, including Head Start, Vaccines For Children, and the Child Care and Development Block Grant. No single budget category accounts for the majority of outlays on children, but health care spending is the largest at about 29 percent. Among other particularly notable programs and categories, spending on social services and non-Social Security income support makes up 16 percent of federal outlays on children; education and training makes up 11 percent; Child Tax Credit outlays and child nutrition programs (including the national school lunch and school breakfast programs) make up 5 and 6 percent, respectively; and CHIP represents about 4 percent. Moreover, the share of federal spending going towards children will shrink over time, and the federal government will soon spend more on debt service payments than it does on children. Based on the 2017 Kids’ Share report’s methodology, we estimate that federal spending on children will decline from roughly 2 percent of GDP in 2017 to about 1.8 percent of GDP in 2027, or from 10 percent of noninterest spending to about 8.5 percent. Meanwhile, CBO projects that the cost of major health and retirement programs for people age 65 and over will grow from 7.2 to 9.3 percent of GDP, or from 37 percent of noninterest outlays in 2017 to 45 percent by 2027. Net interest payments will rise from 1.4 to 2.9 percent of GDP, as rising debt levels drive up the cost of government borrowing. Part of this can be explained by demographics. The number of people age 65 and over is rising significantly while the population under 18 will grow very slowly. But as discussed in the next section, a large share of the increase in old-age programs stems from their automatic growth and preferential treatment in the budget process. Inasmuch as the budget should reflect the priorities of lawmakers and the public, the budget process should not unfairly bias budget outcomes by tipping the scales in favor of certain priorities over others. However, the current budget process disadvantages children’s programs relative to other major federal programs in several major ways. First, nearly all federal spending on older adults is mandatory and determined by existing laws. Meanwhile, Kids’ Share estimates about one-fifth of all federal spending on children is discretionary, and that ratio doubles when you focus on child-specific spending. K-12 education, early childhood support, and housing assistance are all primarily on the discretionary side of the budget. This spending must be appropriated by lawmakers each year, and it is generally subject to greater scrutiny than mandatory spending. It is also more easily reduced, as shown by the enactment of discretionary spending caps during the 1990s and this decade. Even among mandatory programs, there are important differences between programs for the young and the old. Open-ended entitlement programs like Medicare are not capped at a specific spending level and are allowed to grow each year as the number of eligible beneficiaries and authorized benefit payments increase. By contrast, several mandatory programs that largely benefit children, particularly payments to states, such as CHIP and Temporary Assistance for Needy Families (TANF), are capped at a specified level provided in authorizations. Relatedly, many of the mandatory programs benefiting children must be authorized on a regular basis or are “appropriated entitlements” that are funded in annual appropriations acts, unlike permanent programs like Social Security or Medicare. Certain spending programs, including Social Security, Medicare, and federal highway spending, have a dedicated revenue source meant to offset their cost and increase their political support. Meanwhile, spending on children is overwhelmingly funded through general revenues. Finally, most health and retirement programs for the elderly also have built-in growth, automatically increasing benefit levels each year with inflation, wage growth, or health care costs. Some programs for children, such as Medicaid and child nutrition programs, also benefit from some built-in growth, but others, like TANF and the Child Tax Credit, are not indexed at all and will decline in real terms over time. This disparate treatment in the budget process often puts children’s programs at a disadvantage in budgetary decisions. Recent efforts to reduce spending have placed more of the burden on programs that favor children while allowing those that favor the elderly to continue to grow. While most mandatory programs benefiting children were exempted from spending reductions under the 2011 Budget Control Act and sequestration, the roughly 20 percent of federal children’s spending subject to spending caps — including federal K-12 education funding, Head Start, and several social service programs — fell by about $31 billion in real terms (30 percent) between 2011 and 2016 according to Kids’ Share. Assuming all nondefense discretionary spending is reduced proportionately to meet the sequester-level caps, inflation-adjusted spending on these programs will continue to decline. As the growing costs of adult entitlements continue to put pressure on the budget, policymakers reluctant to reform those programs have instead proposed greater reductions in spending on children. For example, President Trump’s FY 2018 budget includes more than $2 trillion in deficit reduction from large cuts to discretionary spending and mandatory programs benefiting children, like Medicaid and TANF. The budget included no meaningful reductions, however, in Medicare or Social Security retirement benefits. The relatively small share of spending devoted to children is not the only way the federal budget disadvantages the young. The federal government’s worsening fiscal trajectory threatens to put additional burdens on both current and future generations of children. First, today’s children will be forced to deal with the consequences of our growing national debt. If left unchecked, higher debt will hold back private investment and slow productivity and wage growth. By 2047, when today’s children are in adulthood, debt is projected to reach 150 percent of GDP, and average incomes will be $5,000 lower (in 2017 dollars) than if lawmakers put debt on a downward path. Furthermore, the longer policymakers wait to address our fiscal problems, the more concentrated any eventual solution will be on later generations in the form of higher taxes or fewer government benefits and services. For example, stabilizing the debt at its current level of 77 percent of GDP would require annual tax or noninterest spending adjustments equal to 1.9 percent of GDP starting in 2018. Waiting ten years increases the size of the necessary fiscal adjustment to 2.9 percent of GDP and puts more of the burden on later generations. Second, growing debt will lead to rising interest payments that could threaten to crowd out funds available for children’s programs. Interest payments on the debt are the fastest growing part of the budget and will be larger than all federal spending on children by 2020. By 2047, debt service costs will be larger than any single spending program in the federal budget. Rising interest costs will put significant pressure on other parts of the budget, particularly for programs that are perceived as relatively easier for lawmakers to cut. And as mentioned above, the current budget process makes it more likely that spending on children is put on the chopping block. Budgeting is about managing limited resources across competing priorities, and it inherently involves difficult tradeoffs. Policymakers need to address our large and rising national debt, and doing so will require many tough choices and sacrifices. However, younger generations have clearly not been prioritized in recent budget decisions. The public debt that they will have to bear has grown substantially, while the programs that invest in them and help ensure their needs are being met have been pared back to make room for additional spending on old-age entitlements and debt service payments. Spending on children accounts for a small and shrinking share of the federal budget, and its treatment in the federal budget process helps make it an easier target than the real drivers of long-term debt and spending growth. In later papers in this series, we will explore each of these topics in greater depth and outline possible steps that policymakers can take to improve the budget process and level the playing field between spending on children and other priorities.